What Type of Rock Drill Bit are You Looking For? Contact us today for more information on our full line of Epiroc / Atlas Copco rock drill bits or if you have questions about pricing or ordering, complete our "Request a Quote" form and a member of our sales team will contact you. Epiroc / Atlas Copco Secoroc has a comprehensive range of rock drill bits that have been strategically designed to match all conceivable industries and applications. Each Atlas Copco rock drill bit is made from the highest quality tungsten carbide steel and precision machined to produce a perfect drilling tool. These bits are then heat-treated to the proper hardness which facilitates excellent surface compression and fatigue resistance. Manufactured in-house, each bit is specially finished to the required shape and fitted with the correct sized button bits. Rock Drill Sales offers a variety of rock drilling bits, including: tophammer bits, rotary / tricone bits, DTH bits and PDC bits. We also stock and sell a great selection of bit thirds for horizontal drilling applications. 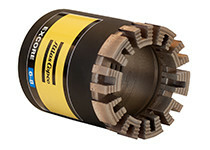 Atlas Copco offers five basic bit designs: Convex, Flat Front, SpeedBit, Concave, and Rocket Bit. These trademark designs are equipped to handle all types of rock drilling, whether hard or soft, abrasive or fractured.